Publication Date: July 18th 2017. Bernice Aurora Wescott has one thing she doesn't want anyone to know: her name. That is, until Bee meets Levi, the local golden boy who runs a charity organization called The Color Project. Levi is not at all shy about attempting to guess Bee’s real name; his persistence is one of the many reasons why Bee falls for him. But while Levi is everything she never knew she needed, giving up her name would feel like a stamp on forever. And that terrifies her. When unexpected news of an illness in the family drains Bee's summer of everything bright, she is pushed to the breaking point. Losing herself in The Color Project—a world of weddings, funerals, cancer patients, and hopeful families that the charity funds—is no longer enough. Bee must hold up the weight of her family, but to do that, she needs Levi. She’ll have to give up her name and let him in completely or lose the best thing that’s ever happened to her. 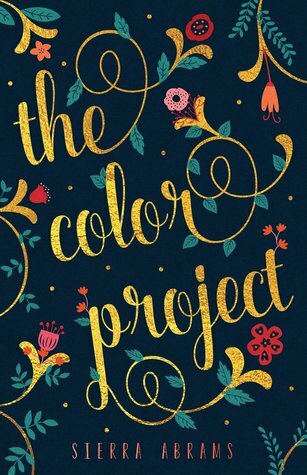 Anyone else excited for The Colour Project? I really love this cover. The story sounds kind of sad, though! Nice pick, Amy! I agree with Angela & Brittany, that cover is GORGEOUS!! It's also really cute!! I LOVE flowers on book covers, whether they're real or stylized ones! And I LOVE the combination of bright, colorful flowers against a dark background, too! Having said all that, I'm wondering if I can handle the plot....sounds a bit too sad for me, IMHO. However, I like the way the relationship is described in the synopsis. I think I'll wait for your review, Amy! It is! And same, I also adore flowers on covers!!!! Yeah it does sound sad :( Haha okay! I'm only still on the fence about this one, but that cover always catches my eye! Nice pick! Been seeing this one around a bit! Hope you enjoy it too! Yay great :) Yeah, hopefully! I've seen this book around! I knew the author as "just" as blogger years ago and she is awesome. :D I hope you enjoy this book when you get the chance to read it! Oh wow that's so cool!! YAY!! I hope we both get to read it soon! Yay I'm glad :) Thanks! Love that cover! It is stunning. And the synopsis sounds like it would be a seriously emotional read. It is stunning! And yeah, it does. I've heard a lot about this one, I can't wait to get my hands on it when it gets to my library. I hope we both enjoy this one. Yay, hope you get to read it soon then!